Durng the Carolingian era there was a dungeon at this site. 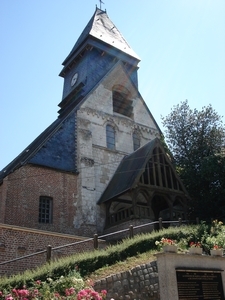 In the 10th century, the Count of Montdidier inhabited this fortress, His wife had the church of Notre-Dame built next to it. Philippe-Auguste made the castle his royal residence and restored the fortifications. During the 11th century it became the seat of the law courts. Then in 1800, the courtroom became the office of the state prosecuter. Destroyed during the First World War, this building was rebuilt in around 1930 in a neo-gothic style, but the internal layout kept the same characteristics. Only the base and the adjoining Philippe-Auguste tower have been preserved.